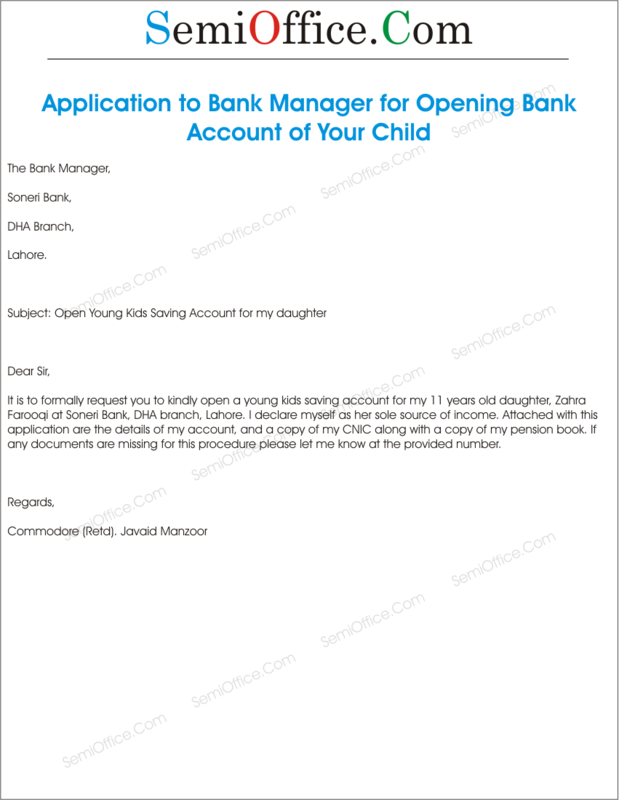 Sample application letter to bank branch manager for opening of bank account for yourself, your kids, your mother, your father, siblings, your wife or any other family members of your family. 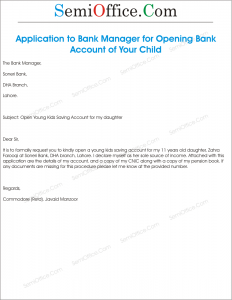 Bank account can be opened for single person or a joint bank account like you and your daughter, you and your son. It is to formally request you to kindly open a young kids saving account for my 11 years old daughter, Zahra Farooqi at Soneri Bank, DHA branch, Lahore. I declare myself as her sole source of income. Attached with this application are the details of my account, and a copy of my CNIC along with a copy of my pension book. If any documents are missing for this procedure please let me know at the provided number. This application is a request to open a new account of my daughter at your bank. As my daughter is now 18 years old and eligible to hold an account in the bank. Due to my business I usually stay out of the town and in my absence my daughter needs funds for her qualification. So It would be helpful to transfer money from other cities whenever she needs them from me. It would be highly appreciable if this whole process takes less than two weeks because after that I would not be available in this city. I hope you are doing well. I want to open an account in this bank. The type of account should be saving because the main purpose of opening this account is that I am trying to save some money. I have another account but could not manage to save the money in it. I have also been through your saving account benefits and like the most. I have attached all required document with this letter to open the account. I hope you will proceed my application as soon as possible. I would be very thankful to you. I have read a lot about the success and customer service of your bank from my friends and social media , it create interest so I also want to open a Saving account in your bank and I also want to enjoy your customer service. I hope you will process my application for account opening as soon as possible.